A couple of months ago, there was an incident where a neighbor’s vicious dogs attacked a woman and mauled her to death in her own yard. These dogs were trained by two people who taunted this woman daily with these dogs. The dead woman was had putt up privacy fences to discourage anymore issues with these people AND their dogs….but to no avail. She is dead and the people who owned and trained the dogs, to the best of my knowledge, never were formally charged in her death. Again, my point is made: We worship the creation rather than the Creator. And, how can we possibly charge anyone with murder when we consistently murder 72 Ohioans daily [over 4K nationwide] with abortion? 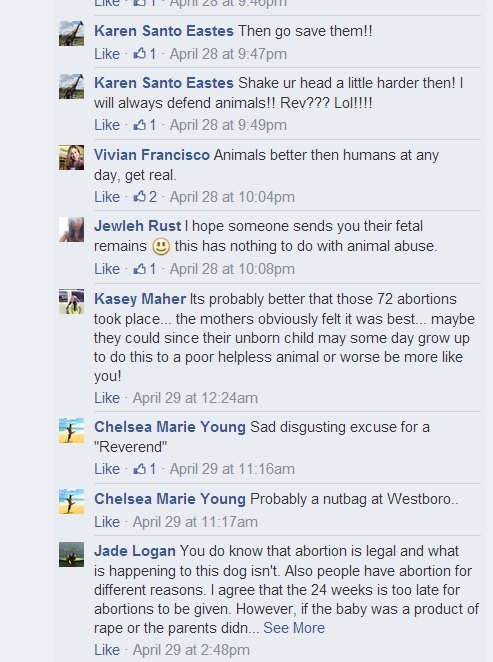 How then can people discern what murder is when it’s perfectly LEGAL? 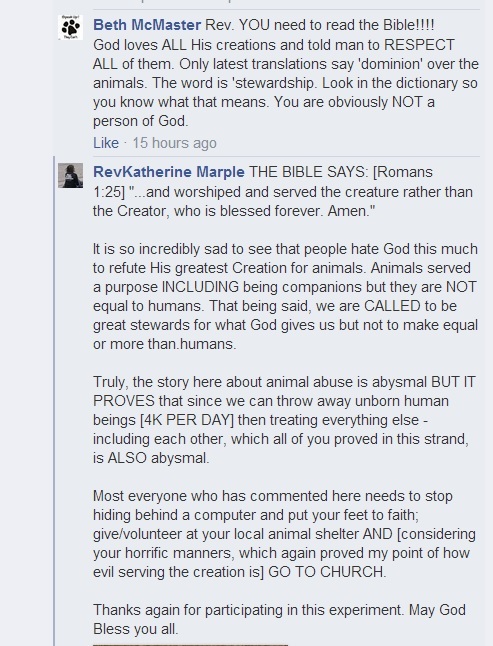 SO, regarding my previous post about animals being treated equal to or better than God, It’s interesting and somewhat disheartening what people believe God says, thinks or does. I would be willing to bet big that they have years of dust on their Bibles, if they actually own one….but they sure do ‘know’ what it says. Hiding behind a computer is just plain cowardly. Here are the rest of the responses as of last evening. Still, after all this time, people still want to beat up the Reverend rather putting their feet to faith or see what their Bible ACTUALLY says. I say the same to those that are prochoice who love to hide behind the computer but never show up on the sidewalk except to scream expletives and such. 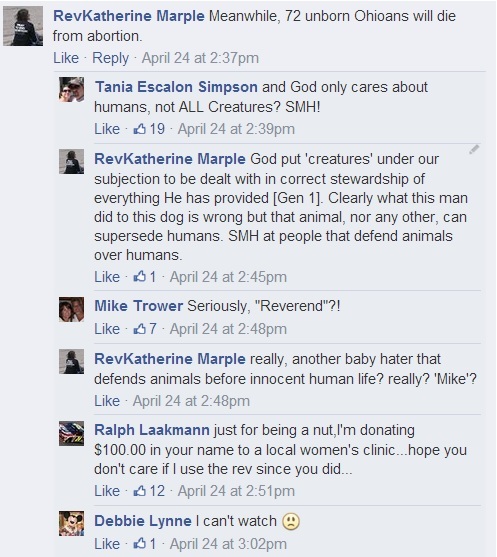 It is so incredibly sad to see that people hate God this much to refute His greatest Creation for animals. Animals served a purpose INCLUDING being companions but they are NOT equal to humans. That being said, we are CALLED to be great stewards for what God gives us but not to make equal or more than.humans. Truly, the story here about animal abuse is abysmal BUT IT PROVES that since we can throw away unborn human beings [4K PER DAY] then treating everything else – including each other, which all of you proved in this strand, is ALSO abysmal. 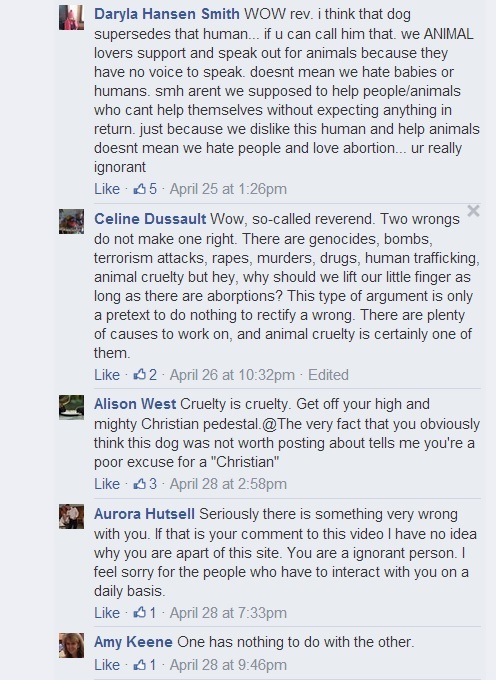 Most everyone who has commented here needs to stop hiding behind a computer and put your feet to faith; give/volunteer at your local animal shelter AND [considering your horrific manners, which again proved my point of how evil serving the creation is] GO TO CHURCH. v21 because, although they knew God, they did not glorify Him as God, nor were thankful, but became futile in their thoughts, and their foolish hearts were darkened. v23 and changed the glory of the incorruptible God into an image made like corruptible man—and birds and four-footed animals and creeping things. Thanks for continuing to contend for the faith, Rev. Katherine. I know it hurts to be attacked by the likes of these people, but Jesus warned us we would be hated and persecuted because we choose to follow Him and obey His commandments. Who woulda thunk that trying to love our neighbors according to Jesus’ word would’ve produced so much hate? In the last days, my friend.